Roman Skorniakov has been enjoying his figure skating even more since moving to the United States to train. Uzbekistan’s Roman Skorniakov has been enjoying his skating even more since moving to the United States to train. Lacking enough ice time in Uzbekistan for year-round training, he and his wife, Uzbekistan’s ladies champion Tatiana Malinina decided to move to Dale City, Virginia, where they coach younger skaters to fund their own endeavors. After this season, the couple plan to teach full-time. Skorniakov participated in his second Olympics in Salt Lake City. He finished 19th in 1998 and again this year. He has won a silver medal at the 1999 Asian Games, finished as high as seventh at the 2001 Four Continents Championships, and reached 14th at the 1998 Worlds. He finished 20th at the 2001 Worlds and 19th this season. “I’m happy with last season,” he said. “I felt like my performance was about on the same level at all my competitions.” But since he doesn’t have a quad, Skorniakov knows he cannot move up much in the standings. His favorite jump is the triple Axel. He usually opens his long program with a triple Axel/triple toe loop combination and closes with a triple salchow/triple toe, but has been inconsistent on some of his triples, especially the lutz, which he considers his hardest jump. Roman began skating when he was four after a friend began attending a figure skating school. He liked what his friend was learning and convinced his parents to let him skate too. “Skating gives me the opportunity to be creative while doing something I like,” he explained. I’m going to compete at least until the next Olympics, but I don’t think too far ahead. I try to concentrate on the current season and making my programs the best that I can. I think I’d like to coach after I’m finished competing, but maybe I’ll try a little of everything to see what I like best.” Roman graduated from the Siberian Academy in Physical Culture in Omsk, Russia. Skorniakov was coached by Igor Ksenofotov, but with the coach’s death in an accident, he and Malinina are coaching themselves. He spends about three hours a day on ice and does a little weight training off ice. Skorniakov enjoys skating to classical music, but has gone in a different direction this year. 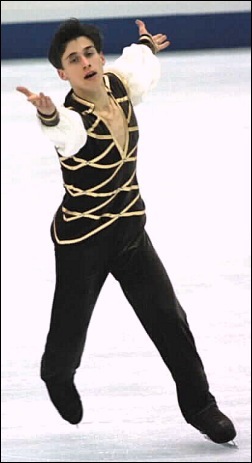 Alexander Zhulin choreographed his programs: “Jalousie” by the Boston Pops Orchestra for the short and “The Professional” soundtrack by Enrico Morricone for the free skate. Off ice, Skorniakov likes to listen to music, especially Pavarotti, and go to parties with his friends. When he was younger, he played soccer and hockey and skiied cross country but now he limits his sports activities to swimming, tennis, and basketball. He also likes to work on his car. For vacations, he usually travels home to see his family, but would like to travel “somewhere warm and sunny with beautiful beaches.” He likes to read, but now that he’s living in the United States, he’s spending his time perusing the Russian/English dictionary. ← Previous Story Fans or Fanatics? Meryl Davis and Charlie White are the first U.S. ice dancers in history to win the World title (2011). They are also the 2014 Olympic Champions and the 2010 Olympic silver medalists. More on Meryl Davis and Charlie White from Golden Skate.